Rossi, who has lost three high-profile statewide elections in the last decade-and-a-half, advanced easily in Tuesday’s 8th Congressional District primary. His Democratic opponent this fall remains to be determined. 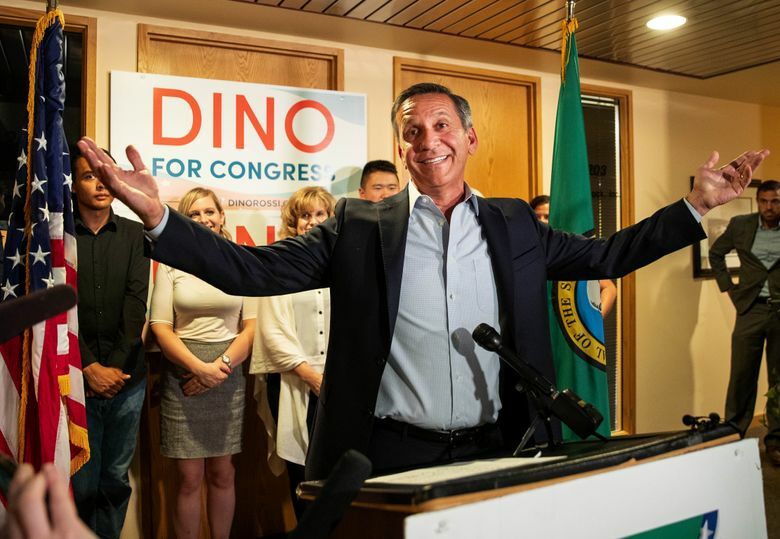 Washington Republicans will once again pin their hopes on Dino Rossi in a marquee political contest, counting on the former state senator and real-estate investor in the nationally watched race to succeed retiring U.S. Rep. Dave Reichert. Rossi, who has lost three high-profile statewide elections in the last decade-and-a-half, advanced easily in Tuesday’s 8th Congressional District primary, capturing about 43 percent of the vote. His Democratic opponent this fall remains to be determined. 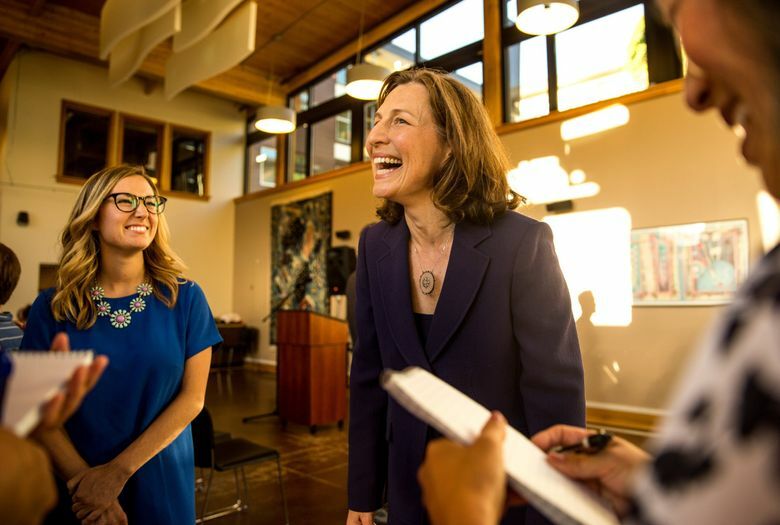 Pediatrician Kim Schrier was in second place Tuesday, with about 19 percent of the vote, just ahead of attorney and former King County deputy prosecutor Jason Rittereiser, at 17.5 percent. Tens of thousands of votes remain to be counted in the coming days. Rittereiser wasn’t giving up, saying he was excited the race was so tight, given Schrier and her allies vastly outspent him. “We are definitely in this thing,” Rittereiser said by phone from an election-night party in Ellensburg. “My generation tends to vote later,” he added. At 34, he is the youngest of the leading candidates in the race. Speaking at a state Republican Party headquarters gathering in Bellevue, Rossi said he’s confident no matter which Democrat he faces. “It will be the most far left opponent I will ever have,” he said, singling out especially Schrier, as part of the Democrats’ “resistance” movement. “You’re telling the world you’re not going to work with anybody else unless they actually agree with you on everything,” Rossi said. 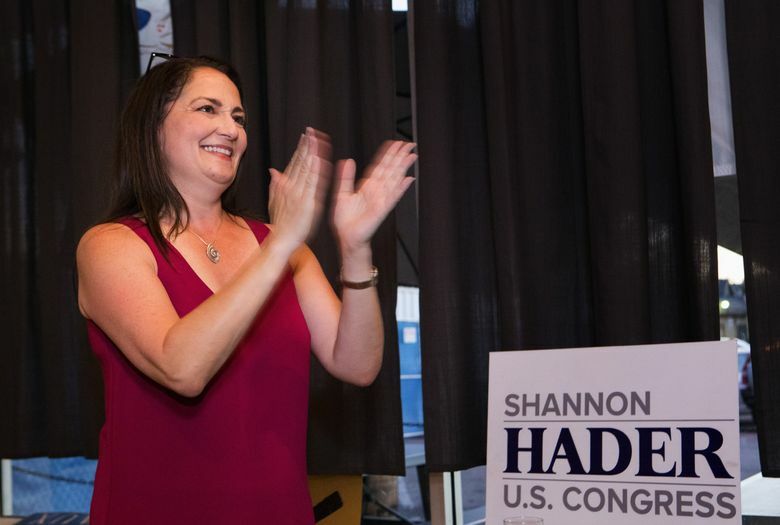 The fourth-place finisher, Democrat Shannon Hader, a former top federal public-health official, conceded at an election-night party in Auburn, after trailing with less than 13 percent of the vote. She urged supporters to unite for the fall election. “I’m less concerned about what happened tonight and more concerned with looking forward,” she said. The 2018 midterm race will be the fourth time in the past 15 years that Republicans have turned to Rossi, one of the state’s best-known GOP politicians even though his last election victory came 18 years ago in a re-election to the state Senate. Rossi rose to prominence in 2004, when, as the GOP candidate for governor, he nearly pulled off an upset win over then-Attorney General Christine Gregoire. Declared the victor by a razor-thin margin on election night, Rossi saw the result reversed after two recounts put Gregoire ahead by 129 votes. A Republican lawsuit seeking to invalidate the election was unsuccessful. Rossi more decisively lost a rematch with Gregoire in 2008. He unsuccessfully challenged U.S. Sen. Patty Murray in 2010. In each of those statewide losses, Rossi carried the 8th District, giving Republicans hope that he can win this year. The politically moderate district runs from east Pierce and King counties, across the Interstate 90 corridor to Kittitas and Chelan counties. It has never elected a Democrat to Congress. Democrats are banking on a high-turnout “blue wave” to reverse their fortunes, noting the 8th District has favored Democrats in presidential elections. Although a first-time candidate with no experience in government, Schrier’s supporters see a compelling personal profile for a midterm election in which health care and reproductive choice may be atop many voters’ minds. Schrier, who lives in Sammamish, has worked for 16 years as a pediatrician for Virginia Mason Medical Center in Issaquah. Like many Democratic women, Schrier was sparked to focus on politics after the election of President Donald Trump in 2016 and the GOP’s health-care overhaul last year. He also played up his history as a prosecutor of sexual assaults and violent crime, and as a private attorney representing workers accusing employers of discrimination. The 8th District seat is among the two dozen or so that could decide control of the U.S. House next year. With Reichert’s retirement, it has been rated a “tossup” by national political analysts. 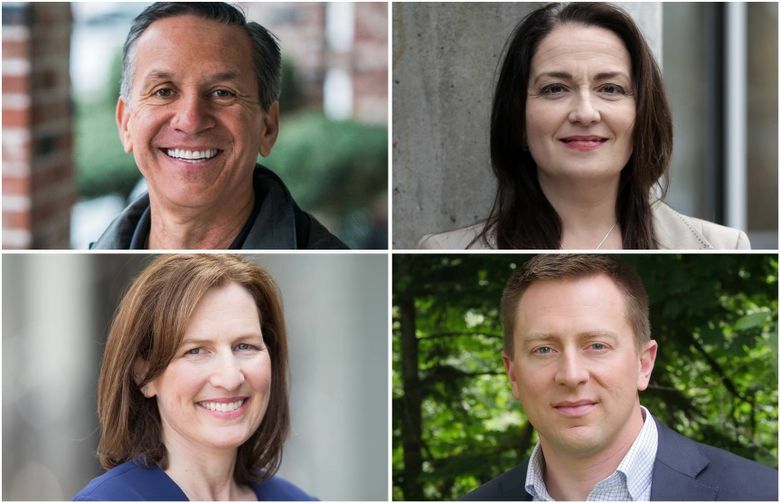 “I don’t think WA-8 is a ‘must-win’ for House Democrats, but certainly you’d think the Democrats will need to win many seats that are like it — open seats that Hillary Clinton carried in 2016,” said Kyle Kondik, managing editor of Sabato’s Crystal Ball, a nonpartisan elections-and-politics newsletter published by the University of Virginia.